Update on James P. Bishop crew. 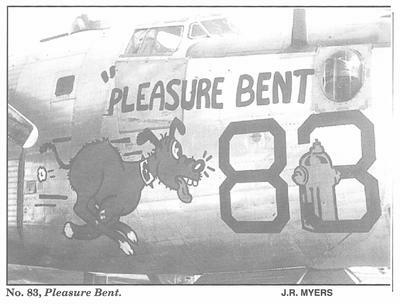 B-24J #83 "Pleasure Bent" Shot up over Vienna and ditched in the Adriatic Sea 10/17/1944. 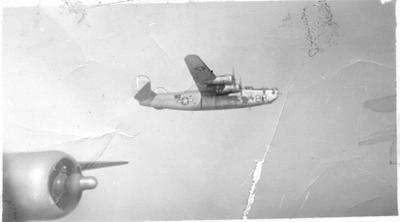 Whole crew survived due to the skill of the Pilot 1st Lt James P. Bishop & Co-Pilot 1st Lt. Greg T. Vanvakerides. Bishop was awarded the DFC for heroism. The navigator 1st Lt. James R. Gill was awarded The Soldiers Medal for saving the drowning Bishop after they ditched. Bombardier 1st Lt. William R. Davis was awarded the purple heart. A few weeks later pilot 1st Lt Greg Vanvakerides had to ditch again. Do to his skill and experience from the 1st ditching he survived with only a broken leg. 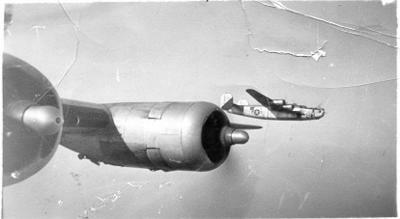 10/17/1944 mission #350 Target : The Vienna South Ordinance Works. With Ploesti destroyed the preceding Summer, Vienna and Berlin were the most heavily defended targets in Europe. Photos are of old #83 "Pleasure Bent" she now rests at the bottom of the Adriatic Sea. I' still sorting through all Dad's stuff. A pile of strike photos. I'm Weido Chipoletti's son, Neal A. Chipoletti. Happy to confirm my dad is 91 and still going pretty good these days! If anybody would like to speak with him, please contact me via email (sketcher444@hotmail.com). My father's hearing is not real good (must have been the engines or gun noise! Pretty sure they did not do much for hearing protection back then) and he has trouble hearing on the phone. I can help with that by setting up a call to him while I am there to help relay conversations. Thank you to all our heroes that have served this country to protect us and our freedoms! A shot in the dark..Just for the heck of it I called an old phone number my Dad had for Weido Chipoletti nose gunner.. Mr Chipoletti is alive and well 91 years old..What a thrill to talk with him. I'm still trying to get in touch with Jim Gill or family..will keep y'all informed on crew status..
Excerpt from My Dad's report on the mission. Things happened fast. I saw the enlisted men come out of the waist windows, that is all except the radio operator (John Norris). He got caught on some wires inside and was trapped. The armorer gunner ( Tom Boothby) was back in like a flash and in a few seconds he came out dragging the radio operator behind. John Norris (the radio operator) had been cut up a little and thought his end had come when he found himself trapped. But he’s alive and kicking now. John H. Norris was my father and he told me stories of this event. He was also saved when he was stuck in the bomb bay. Later he helped rescue a crew member when they went down again. He had a wooden replica of this plane. I used to play with it when I was kid. My dad is the one with the cap on in the back row. Thanks so much for posting this story. It's the first time I've seen the crew picture you posted. I would love to have copies of the pictures you have. Please finish this story! Thanks! Join in and write your own page! It's easy to do. How? Simply click here to return to Our veteran's stories.